So you’ve got a child, and you want to encourage their love of computers by getting them started in a programming language, but you don’t know which one to start with. Or maybe you are the “kid” reading this, a middle school kid, a college kid (or just a kid at heart), knowing that you are interested in learning to write code, but feeling overwhelmed by the choice of languages. Don’t feel bad; according to one recent Quora answer, there are over 250 programming languages in the world, and that number only grows with each passing year. MIT did a great service to the world when they created Scratch. 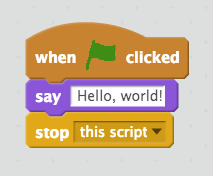 While all of the other languages on this list require a solid understanding of reading and typing ability, Scratch can be understood entirely through manipulating symbols that represent commands. It’s a visual language, but one that allows for many of the same concepts that come in more sophisticated languages like variables and loops. Because it’s light on reading and typing, very young children can learn Scratch. While its designed for kids 8 to 16, its definitely not unheard of for kids even younger to use it, making it the best choice on this list for elementary students. As I mentioned earlier, when I was a kid, GW BASIC was really popular. While BASIC’s heyday is past, it’s far from a dead language. There are a couple of places a kid could easily start programming in BASIC, a language that is known to be very understandable to read and write. The first is with Visual Basic from Microsoft. Visual Basic can be used to write programming macros to interact with Microsoft Office to automate repetitive tasks, Office being an environment where most students are already familiar. If this doesn’t appeal, how about TI-BASIC, the flavor of BASIC from Texas Instruments. This can be used to program graphing calculators like the TI-84 Plus CE and TI-Nspire CX. Do you have a kid that is obsessed with their iPhone or iPad? How thrilled would they be to write their own apps for iOS? In 2014, Apple released a new language specifically to make it easier to write apps for iOS called Swift. This was great news because previously, coders had to write their apps in a more challenging language called Objective-C. Swift has gotten rave reviews since it was released and has rapidly grown in popularity. I don’t know that Python is the easiest language on this list. That’s got to go to Scratch. 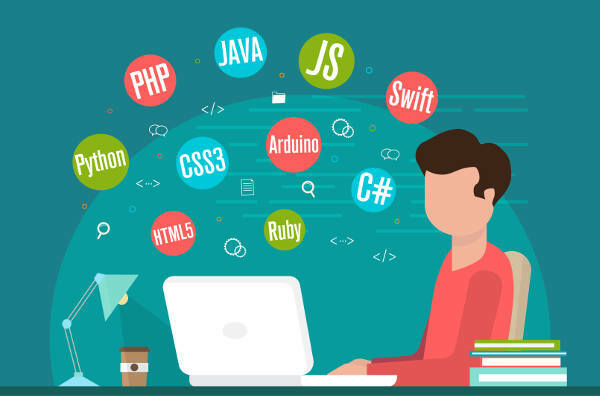 I also can’t say that it’s the only “easy” programming language on this list that can do “grown up stuff.” You can get a lot done with Visual Basic if you have the right kind of job. However, in terms of languages with a quick learning curve but that also enable you to do a ton of interesting things, I doubt there’s anything that beats Python. Python can be used to build web apps. It can be used to connect to web APIs. It’s arguably the leading language for machine learning and AI applications. It’s great for building visualizations. It’s just a great all-around language. I once had a Python instructor tell me, “You know, there probably aren’t a lot of things that Python is strictly the best language for. But it comes in second or third for just about everything.” At a time when most languages specialize, that makes Python a great language to learn, especially since its code reads more like regular English than most languages. This short list includes only a handful of the hundreds of available computer languages. What was your first language? Have I left a good one for kids off the list? Let me know in the comments below.